Bikes for the next gen of shredders: Grom MTB’s! With the rise and rise of MTB, it’s become apparent that the bikes available for the younger shredders in our midst were somewhat lacking when pointed down trails beyond footpaths. 2018 see’s some of the more progressive companies dropping very serious equipment for the kids, and not just loading em up with good components, thats’ only half the story. Geometry and weight is probably the biggest deciding factor in whether a kid digs his first forays into MTB or hates it. So many bikes that claimed to be MTB’s for kids ran frame designs that, if scaled up, would be unridable by us, let alone pick up and put on a rack…The results we’re seeing today thanks to this new en of kids bikes is nothing short of epic. Smaller riders out on the trails with bigger visions of what’s possible on the dirt. For some this brings the inevitable ‘when I was a kid, we rode bikes that that didn’t have brakes’, and ‘I can’t justify spending that much on my kids bike’, but that’s only half the story. 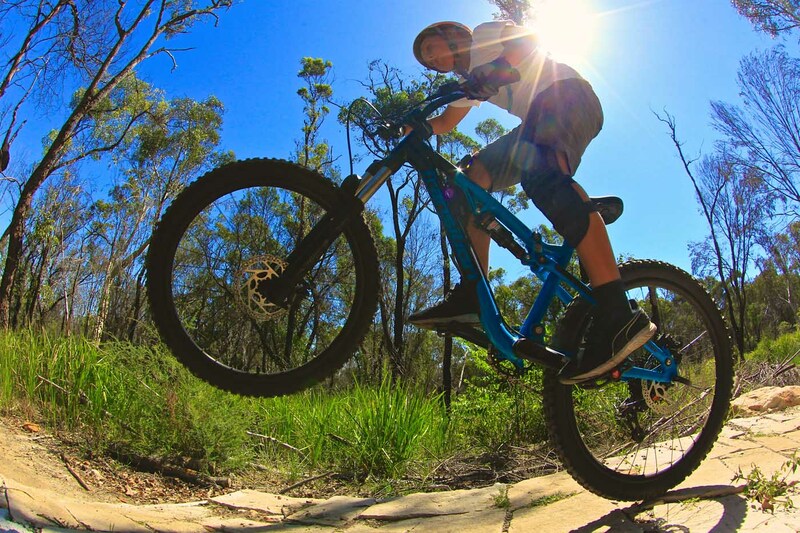 With consoles, tablets and phones costing serious coin, a bike that will not only keep your kid fit, motivated and out of the house, preferably with you out on the trail all weekend, it becomes a no-brainer. There ain’t much in this world as satisfying than seeing you child shred a trail and get stoked! With all that in mind, we gathered three of what we think are the most dialled kids MTB’s on the market and roped in some little groms to give them a shred to help you understand a little more about the future of MTB! OK, tell me, if you were a kid this bike wouldn’t just blow your mind… Commencals range of kids bikes runs deep and the 2018 Supreme Shiny 24 is the heavy hitter of the junior range. It’s also quite possibly the benchmark as to what all DH oriented kids bikes should be. I hear you thinking, a DH bike for a 120cm tall kid? Yep, Commencal have done it, and done it with style. Let’s be clear, the Supreme is a bike that will be in need of some gravity assistance on a ride, it’s a big travel bike for the size of the rider and wheels! It’s burly looking 6061 alloy frame shares a few features with it’s bigger Commencal brothers and is built to tackle some serious terrain, that headtube looks set for sucking off anything. Come to think of it, it’s not looking too dissimilar to Rampage bikes back in it’s infancy! The SRAM NX 11 speed with a 32 front, 11-42 rear can pedal up a trail, especially if there’s the lure of downhill at the end of it… With 140mm of Rock Shox Monarch Air on the back and, you’re reading right, a 150mm RockShox Pike RC fork upfront, 26inch Boost no less, the Supreme is ready for your next family trip to any MTB Park here or overseas. With their deep well of knowledge when it comes to building a complete, Commencal has carefully fitted the components on each model to suit the rider’s size: the handlebars, stems, and cranks grow as the bikes do, a factor overlooked by so many kids bikes in years past. Sag is crucial on the Supreme, not enough and some riders may feel too high off the ground, the high front end does mean standover is minimal especially on anything slow and technical. With its dialled geo and short 40mm stem, the Supreme was a favourite once we had some speed and a trail pointing down a hill. It’s big Kenda rubber and sizeable travel just eating up features that would usually be walked around awkwardly. Sizing up jumps that had eluded some of our little crew were sessioned rather than baulked at, and the laughs at being able to ride out of potential OTB’s was hilarious. Tektro’s new hydraulic brakes had instant fans too with their great feel and solid stopping power. In general, the Supreme 24 was a favourite. Until it had to be pushed back up…. Rocky Mountain brought their big guns to the table when they stepped into the kids MTB realm, their Reaper model is squarely based on the Thunderbolt trail bike platform with the versatility of running 24 or 26 inch wheels. Something that many parents struggling with the dollars involved on these bikes may see as a defining factor in a purchase. And yes, as a result, 26 is far from dead! Wheel sizes aside, it rolls with 130mm travel on the rear with 120mm up front and while that sounds strangely like downhill bikes back in the 90’s, that little extra cush on the backend is probably a good thing for the little ones when hitting stuff that bit harder… The frame is built with 7005 hydroformed alloy just like Rocky Mountain’s regular sized frames and runs the same pivot bearings, plus features their RIDE9 geometry switch that allows you to dial in head angle and suspension rate. Though it could be said that once you set sag, most kids will be more than stoked on having a rear shock! Parts wise, it’s a pretty sweet deal with Shimano hydraulic discs on stopping duty, a tapered head tube and slick Shimano 1x drivetrain. Rock Shox Monarch R takes up rear suspension duty with a Suntour Epixon LO DS 120mm fork up front. Both are of course air sprung which allows for a range of rider weights and abilities, although try and contain yourself from to much dialling in of suspension! Rocky’s own parts selection finishes the deal, a short stem, wide bars and a pretty comfy saddle all looking the goods. With a longer wheel base than the other two bikes tested, a result of ensuring 26inch rubber will fit when junior grows, it’s stability on any terrain is a given and it lends itself to being pointed down hill. It wasn’t a slouch uphill either, it’s 28 to 42 gearing taking care of most of our local trails when the kids really dug deep. All were fans of Shimano’s dependable braking feel, one of the crew even getting nose manuals dialled on a landing? Feedback from the grom club did mention it was harder to manual and pull back off bigger drops than the other two bikes, but it felt more stable when it was rough. The the real knowledge came our way when we got schooled on how if it had 26 inch wheels it’d manual way easier… Kids right? When Transition dropped their take on what a kids MTB should be back in 2015, it stood head and shoulders above pretty much all competition in terms of build and out of the box radness. Come 2018, aside some graphic and component upgrades, their Ripcord remains for the most part unchanged. Does that mean it’s still relevant against the latest offerings also tested here? Maybe having some typically dialled Transition geometry and short as hell chain stays has something to do with the resounding yes! With 100mm on both ends, it’s comes with less travel than the Rocky and Commencal, however it’s low slung top tube and burly frame build make it a bike ready for pretty much anything your sprog could throw at it. Their ethos for part spec was to ensure a standard sizing of parts, meaning you’ll be bolting on your old parts when it’s time to replace things! Not that the SRAM GX 10 speed drivetrain or Shimano brakes will need upgrading anytime soon. The selection of Raceface components is dialled as well. It is however not the lightest bike out of the box, that said it’s pretty easy to see that with wide bars, short stem and big tires, the Ripcord’s spec was sorted to last under an aggressive rider (aren’t all kids brutal on bikes?) rather than watching weight. Here here. With that top tube far out of the way, confidence on the Ripcord was high for all our testers (seems the groms hate that feeling too!). All making use of the short chain stays on jumps and a lot of raditiude on anything they could find on the trail. While looking more like a little slopestyle bike, the RipCord proved to be a capable bike on the longer hauls and climbed tech ascents really well, lots of room in the cockpit for moving around and those shorts stays again coming into their own. Shock wise, Rockshox Monarch and 30 Silver fork air chambers were spot on, running pressures maybe a touch under recommended had all the travel in use. It’s so rad to see 10 year olds starting to understand how rebound helps keep traction climbing and in corners. Those 700 grams a piece 24×2.35 Kenda tires, are, in our mind worth their weight in gold. All our grom testers saying how well they gripped, especially when cornering. Though if weight is an issue for your little one, a lighter tire will quickly shed a kilo off the build. Did we mention all were fans of the aero looking eyeleted rims? Nice touch! Massive thanks to Bodhi Wilson and Louie Ewing for shredding our test rigs! Previous ArticleVAL DI SOLE WORLD CUP DH: AMAURY PIERRON IS UNSTOPABLE!